What was with Grant Delpit deliberately trying to take Tua’s knee out? 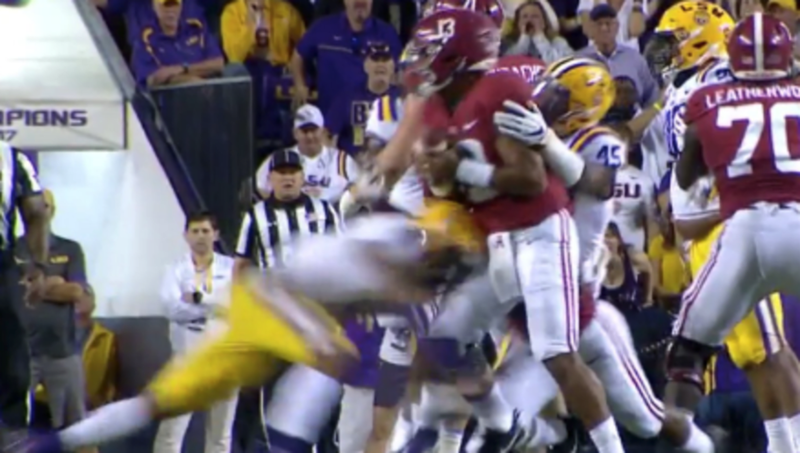 Thread: What was with Grant Delpit deliberately trying to take Tua’s knee out? Re: What was with Grant Delpit deliberately trying to take Tua’s knee out? As John Doe pointed out if Tua's right cleats had been in the ground when taking that hit it's potentially a season ending injury. Absolutely a dirty hit. 2-3 seconds after the whistle. One guy hit high, the other low, like it was planned. If his foot would have gotten stuck in the grass they would have. Initially, I thought it did. It's interesting that some of the players heard the whistle and stopped but the two guys who had Tua in their sights didn't??? When you watch the TV angle replay, Delpit starts to "go low" about 2 steps before he hit's Tua. That's a good observation about his right leg/cleats not being planted too. It caused him to go down like a sack of potatoes, but that's better than what would have happened if his foot was planted. We had been whisted for "false start" but the other foul should have been walked off/enforced after our false start and shouldn't have been offsetting because it occurred after the play. I have not heard anything about alabama staff making a complaint about this to the SEC, why is this? I would think you would do this to at least put a bug in officials ears for next game. I would think there is a process. At the very least it is a legitimate argument that the hit on tua was to deliberately injure. What makes this blatantly obvious is game situation everyone goes for the exposed ball, it was sitting right in front of Delpit and he ignored it. I have not heard anything about Alabama staff making a complaint about this to the SEC, why is this? Saban does not generally play that game. It doesn't help, and it never makes a difference. Because Saban wouldn't publicly say he made a complaint. He very well could have, and we don't know because it wasn't publicized.